The sisters, Catherine, Hannah, Martha, Ada and Rachel SOLOMON, were admitted to the Newcastle Industrial School on 24 August 1868, after appearing in Newcastle Court.15 They had been arrested with their older brother, James, who had escaped from the lock-up before their trial and therefore didn't appear at the same court appearance as at that date he had not been recaptured.16 A warrant, written by Senior-sergeant Peter CONWAY of Newcastle Police, was ordered for their arrest and the sisters were charged with having no lawful visible means of support and no fixed place of abode. CONWAY elaborated on the events that had occurred before their admission to Newcastle. The Entrance Book confirmed that the sisters were the daughters of Mark and Ann SOLOMON, that Ann had absconded and that Mark was destitute.24 These parents were Mark SOLOMON and Angelina (X) GERREGHTY who were married by license in Maitland on 22 January 1855, by G. K. RUSDEN. The consent of friends for the marriage to go ahead was given and this suggested that one of the parties was under the age of twenty-one. It is believed that this person was Ann. The witnesses to the marriage were James and Mary RILEY.25 G. K. RUSDEN was a Church of England minister.26 The baptism of Mark and Ann's eldest child James SOLOMON, who had been born on 6 October, occurred on 20 November 1855. This baptism was performed by C. V. DOWLING of the Catholic Church and the record confirmed Mark and Ann's although Ann's surname was written on this record as GERITY. This baptism was erroneously indexed on the NSW BDM Index under the names Martin and Ann SOLOMON.27 The religious choices for the marriage of and baptisms for the couple are unusual as there was a large Jewish congregation in Maitland at this time. The difference in religion between Mark and Ann may have contributed to difficulties between the couple. Mark was admitted to Maitland about the time of James's admission to the Vernon for stealing a saw and being illegally on a premises. He had been tried in Newcastle court.43 His description from Maitland after his release described that he was carpenter44 and his occupations on his various admissions were reported as a labourer, an upholsterer or a carpenter. The Police Gazette recorded that Mark was again tried in Newcastle on 8 August 1870, for theft and provided a further description upon his release in April 1871 after a six month sentence in Maitland Gaol.45 Mark last was recorded in Maitland Gaol after an appearance in Newcastle Court for vagrancy on 23 May 1872, where he received a month's hard labour. He was released on 22 June 1872, and after this date no further confirmation of him can be confirmed in Newcastle.46 No positive identification for Mark's death has been made. Mark was possibly a son of Mark SOLOMON per the Lady Castlereagh in 1819 and Catherine FLANAGAN aka HANNIGAN a convict, who had been transported on the Mary Ann between 1821 and 1822. Catherine died in Hobart at the age of about 29 on 25 September 1833, where she was described as the wife of a store-keeper.49 After her death Mark went on to marry Hannah MARKS but he died in 1837.50 SOLOMON's will51 is still being deciphered to see if he named his children as one online source has identified that he did have a son named Mark. 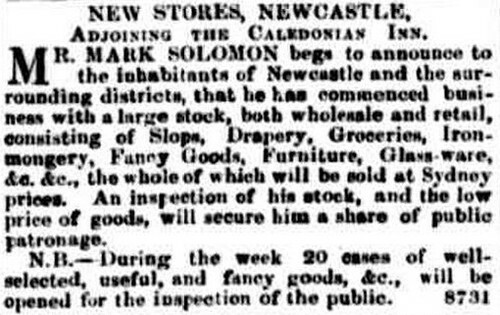 It would certainly appear that sufficient money could have been available for the younger Mark to have established a shop in Maitland, NSW, in about 1853 if this man were his father. The Tasmanian transportee was a successful shop owner in Hobart52 before his death. While the ages were similar, Mark cannot have been the son of Isaac aka Ikey SOLOMON because the NSW Funeral Notice that was placed by two of Mark's children, Mrs. R. E. ISAACS and William SOLOMON53 linked him to his brother, John SOLOMON, who was identified as Isaac's son on the NSW BDM Index. This Mark SOLOMON had married Matilda MILLER in Tasmania and died there of typhoid fever in 1877. The Tasmanian burial record identified that he had been born in England in about 1824.54 It is unlikely that this Mark SOLOMON had a second family in NSW but it is unknown whether the opportunities existed for this possibility to have occurred. The history of Ann GERRAGHTY is currently unknown. Only a birth registration for one of her daughters will provide information of her place of birth and her age. Ann's religion is unclear as it is only known that her children were Catholic. She cannot have been Jewish. Ann had married in a Church of England church but, if the dates were recorded honestly and correctly at the time, was unlikely to have needed to marry because she was pregnant. An Ann GARRITTY alias McQUEEN alias BLACKWOOD was imprisoned in Darlinghurst in 1877 but no description remains. Annie BLACKWOOD deserves further investigation but it has not been undertaken. Michael CAREY b. m. 188260 d.
William Henry FEENEY or SOLOMONS b. 188061 m. d.
Leonard M. CAREY b. 188362 m. d.
(i)t will be better simply to keep the girls separate on restricted diet. It is possible but cannot be confirmed that Ada was the eighteen-year-old girl, Ada SOLOMONS, who entered the Sydney Benevolent Society on 1 October 1880.102 No date of a discharge from the asylum has been positively identified but this admission was almost certainly the same girl as the Mary FEENEY or SOLOMON, for whom there was no admission and who left the Benevolent Asylum on 8 November 1880, with her son, William Henry FEENEY or SOLOMON. William Henry had been born on 2 November and only appeared as FEENEY in the NSW BDM Index with the mother recorded as Mary Ada FEENEY.103 This birth has been very tentatively attributed to Ada as it has not yet been possible to confirm the whereabouts of the Biloela inmate and Ada's acquaintance, Mary FEENEY. Mary FEENEY had been arrested with Ellen SULLIVAN in January 1877 when she was almost sixteen.104 A month after, another admission to Biloela of the thirteen-year-old Mary FENNY occurred.105 The authorities at the time of their discharges have confused the names of the two Marys. Mary FEENEY was actually discharged as Mary FENNY106 with a length of the apprenticeship of just over a year and a half, correctly matching her year of birth of 1861. She was discharged in August 1878 to Pemberton PALMER. The Discharge Book indicated that she had completed these indentures with PALMER but the newspapers confirmed that he had had trouble with her and correctly identify her as Mary FEENEY.107 Mary FENNY was discharged to Goulburn in May 1878 for nearly four years and this correctly matched her year of birth of about 1865.108 Nothing is written in the discharge book for her. This inmate was a girl who was not recorded in any Biloela record as causing a problem on the island. It is therefore unknown whether the authorities again confused the names when the details of the completion of the apprenticeship for Mary FEENEY were filled in. There are only two marks on the record, correctly indicating the year and part year of the apprenticeship. Assuming that Mary FEENEY did complete her apprenticeship then she would have completed it in May 1880 so she could still have returned to Sydney to have the illegitimate child. It also must be considered that the registration of the birth of William Henry FEENEY was more likely to be correct than the admission name. Only the actual records for the Benevolent Asylum are likely to confirm the identity of the boy's mother. In September 1915 Ada was recorded as the next of kin when her son, Herbert, enlisted so it may be that Michael had died by this stage however when Arthur enlisted some months earlier, he named this next of kin as his father.113 It may also suggest that the couple had separated, as when Arthur died in 1927114 his father was recorded as Richard. Ada died on 3 September115 1924. Her death was registered in Auburn as Ada CAREY and the registration confirmed both her parent’s names. No Family Notice has yet been found in the SMH up to and including 6 September. In 1887 Catherine married Mark CONNELL, a Russian129 or German130 immigrant to Sydney. No birth records for any children have been found. Catherine died on 8 June 1917, at Lewisham Private Hospital at the age of fifty-nine. The Funeral Notice identified her as Kate.131 At the time of her death her maiden name – but no parents – was recorded on the registration. She had retained her father's Jewish religion as minyan was held the Sunday after her burial.132 Mark remarried Sylvia McKEOWN in 1927 and had one daughter, Gabrielle. A Trove search for the Strawberry Hills address suggested that it may indicate an auction house or may have operated as part of the Department of Agriculture. Sand's Directory identified a Mrs HAROLD living in Australia Street, Newtown in 1870 but there are no people name HAROLD living in Buckingham Street. Historical electoral rolls may help identify the given name of the man living in Buckingham Street in 1870. It may possibly be James. Without knowing whether a change of given name occurred, Hannah is unable to be accurately traced in the NSW BDM Index. The women who made the following marriages (to 1910) have not been traced and assume that a given name was not changed. There were no women named Ann/i/e SOLOMON or HAROLD who married until 1910. 2877/1889: Hugo HERMAN in Paddington and no trace of this couple can be confirmed in NSW after 1896. Hugo's father from New Zealand died in England in 1894141 so this couple may have moved to either location. 8391/1902: James F. RUSSELL in Sydney and no trace of this couple having children has been confirmed. There are no possible deaths for an Ann/i/e or Hannah RUSSELL. Ivy M. BOYD b. 1887152 m. d.
Martha's birth was registered in Newcastle in 1863 and she was recorded as a five-year-old when she was admitted to Newcastle on 24 August 1868, with her four sisters. Martha was able to read the alphabet and write on slate and like her sisters she was recorded as a Catholic.155 She transferred with the school to Biloela in May 1871 and was recorded as 'In the Institution' on LUCAS's April 1872 list.156 Martha was placed in the school hospital with a gastric illness,157 around 14 September 1874,158 and was still there on 21 September,159 28 September,160 5 October161 and 12 October.162 Martha was apprenticed to H. HALWYN [? ], Esq., the under Colonial Secretary on 11 December 1875. At Bethel House in Sydney on 5 February163 1883, Martha married William John R. BOYD, a tram conductor. Four children were recorded between 1883 and 1889. The family was living at 10 Glenmore Road, Paddington,164 when BOYD was accidentally killed on 2 December 1888,165 just before his last son was born. Martha died in Sydney on 20 September 1895,166 at the age of 32. Both her parents were confirmed on her death registration. Ada placed a Funeral Notice and this identified her last address as 61 High Holbourn Street, Surry Hills.167 Martha was buried with her husband in Waverley Church of England Cemetery.168 It is unknown who cared for the orphaned children of the couple after Martha's death. Charles RALPH b. m. 1882169 d.
John William SOLOMON b. 1878170 m. d.
James SOLOMON aka RALPH171 b. 1879172 m. d.
Ernest Thomas SOLOMON b. 1880173 m. d.
Ada Frost SOLOMON b. 1882174 m. d.
Rachael was almost certainly the mother of four illegitimate children in Sydney between 1878 and 1882. She married Charles RALPH in 1882 in Newtown and they then had two daughters, Rosina and Rachel, who both died as infants. Rachael died at Wallis or Wallace Street, Woollahra, in September 1885.184 Only her father’s name was recorded on her death registration in the NSW BDM Index. Also recorded shortly before her death was that of her daughter, Rachael, so it is almost entirely certain that she died due to a complication of childbirth. Funeral Notices were placed by her sisters, Ada CAREY and Martha BOYD.185 She was buried in Waverley Cemetery but no record of a headstone was recorded on the Waverley & South Head Cemeteries Transcriptions CD.